After much discussion within the CDOT, it has been decided that we will remove the Polk & White location from our connection study. While this effort was only a study to provide us with information on what it would take to build connections such as this one, we recognize the sensitivity to those residents in the area who have concerns. If I can answer additional questions, please let me know. 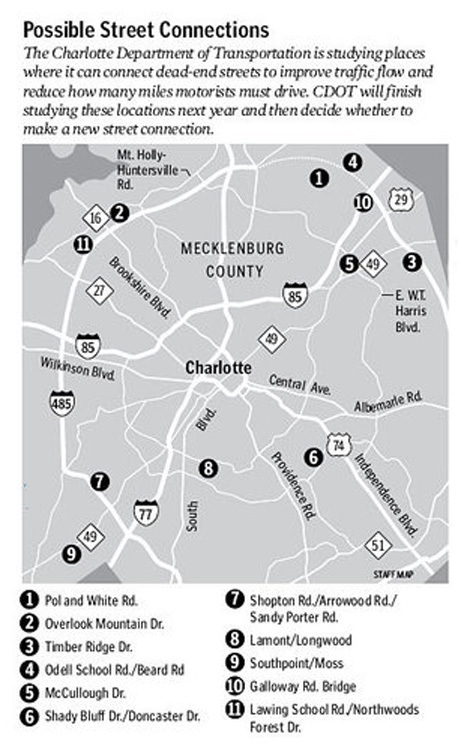 An article in today’s Charlotte Observer confirms some of our fears: the city has plans to possibly connect Polk and White to “improve traffic patterns” within the next two years. This would negatively impact Leacroft by providing another entrance in and out of Leacroft as well as connecting our neighborhood to an area that is known for significantly higher crime rates. Also note, that Matt (contact Info below) is the Program Manager for the Street Connectivity Program. We need to take action. Some of your neighbors have already begun to contact Charlotte Mecklenburg city official to find out how to prevent this from happening. To get the latest information on this topic, join the Leacroft Mailing List (below). We will try to make sure any response we get is posted to the mailing list so that you can stay in the loop. Thank you!! I just drafted an email and came on here to get email addresses for the board. We’ve got to fight this before they even think about it… either that or you’re going to see a for sale sign in my yard very soon! I just sent an email to Mr. Barnes. This is a huge issue and I certainly hope the city will reconsider such a drastic and unnecessary move that can ultimately change the character of this neighborhood. You’re handling this very well and I much appreciate the work and effort you’re putting into this. So many ppl spend time on Facebook and such these days. You’re a bit more savvy than I in that respect. What do you think about putting up a cause or group? Then we can all put up info, ideas and what not that the board can bring up when the issue comes to head. My thought is that we don’t duplicate efforts (I too had printed the Char/Meck crime map to include as a point of concern). Keep up the good work. BTW… I think our “time” of posting is off. I’m posting this on Dec 23 at about 9:45pm and yet it says my post is on Dec 24 at 2:45 a.m. Clearly not a major issue but I thought I’d bring it up. Thanks. Jess – I think it might have to do with moderation or something on the comments. We have 41 members in our Facebook group, do you think FB is a good venue for this? If you could head up that one, I will make sure to get something in the February newsletter. The January newsletter is already published. Mike and I are going to try to get on the city council agenda in January. Definitely trying to approach it from every angle we can on this one. Thanks! Pam got the DOT to remove Polk & White from the connection study!! WAY TO GO PAM! !